While I think the Surfster Double Black looks like a head-on date with a tree waiting to happen, it does have one redeeming quality. 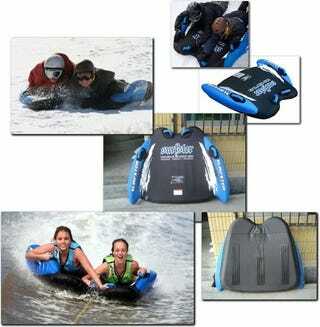 That quality being it conveniently doubles as a two-person body board. That means once you get out of the hospital and finish your rehabilitation in the late spring, this thing will be inflated and all ready to go for summer at the lake house. Where, presumably, you'll experience yet another head injury or concussion. At which point, you'll recover and this thing will be ready for, well, you get the idea. $80 and whatever your ER co-pay might be and this is yours.